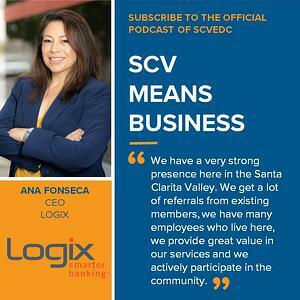 First up we spoke with outgoing CEO Dave Styler and incoming CEO Ana Fonseca of Logix, a community-based financial institution that serves Northern Los Angeles County and the surrounding areas. In making this transition from one CEO to the next, Styler and Fonseca both highlight the importance of prioritizing continuity of company culture and creating a workplace that employees actually want to come to and remain at year after year. One of the reasons they cite for Logix’s success in its over 80-year history is their focus on building relationships with the communities and partnering with nonprofits and charities to bring value. Later this year, Logix will be relocating its headquarters to SCV. Both Styler and Fonseca agreed that a huge draw to the location had to do with the relationship they’ve built with College of the Canyons, and their excitement to develop training programs for their employees, as well as the number of quality employee candidates in the area. Holly then spoke with Karen Bryden, owner of SCV Locations, a company responsible for helping scout and coordinate filming and production locations in the valley. Bryden shared that the Santa Clarita Valley has been such a popular filming location for quite a few reasons, including the more than 20 sound stages and 10 movie ranches that fall within the thirty-mile zone. Additionally, the SCV provides various terrains that can act as different cities, countries, and even planets all within the same relative area, which makes it attractive for film crews who require versatility in a location. Coupled with the ample parking, a community that welcomes filming and partnerships, and easy access to nearby areas that are outside the studio zone but qualify for California state incentives, many crews find that Santa Clarita makes the job much more convenient. 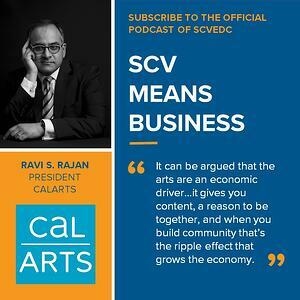 Finally, Holly sat down with Ravi Rajan, president of California Institute of the Arts, to discuss the economic impact art has on our community and culture. As one of the first institutions in the SCV, CalArts graduates have gone on to win Academy Awards, shake up the film industry, and even create the animation giant Pixar. One of their main focuses these days is driving the community to engage with the arts in a meaningful way, like contributing to the Santa Clarita Cowboy Festival and teaching art as both a form of communication and a value proposition. Rajan sees the arts as an economic driver. They not only provide content, but also drive people together and create community, which in turn will require services like coffee shops, gas stations, drugstores, etc. He sees it as a civic responsibility to uphold that community and foster the bonds that form from it. He describes creativity as not just a means to get from point A to point B, but rather getting from point A to a place you’ve invented and then finding a way to get there.